My grandfather Alfred E Green was working in the London Docks before the 2nd World War and had developed into a fine plumber and metal worker. Around 1934, he started working on submarines at Portsmouth (perhaps he was asked to do this because he was a very small man). He also owned a newspaper shop in Undine Street, Tooting which his wife managed, and so he used to cycle to Portsmouth leaving Monday morning and returning to London on Friday evening. This was a distance of about seventy miles each way. He would stop for tea at the Halfway House café in Runfold near Farnham, Surrey. This was aptly named The Halfway House being halfway between London and Portsmouth. My grandfather obviously saw the potential and purchased this property. 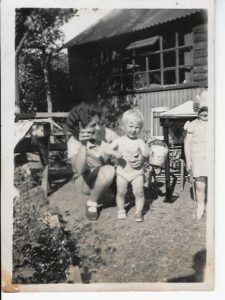 My father also called Alfred, having taken over in 1936, moved the café from the front room of the house into the garden shed. This was built of rough-hewn pine logs (with the bark still on) and corrugated iron sheets. My father changed the name to Alf’s Café. It was extremely popular with the soldiers who occupied all the big houses in the village of Runfold during WW2. In the war all the local large houses had been requisitioned by the government and there were many different British and Canadian regiments passing through on their way to fight. As a ten year old, my favourites were the Canadians and I watched films in their cinema at Holmfields house. This large house was purchased after the war by my father and turned into a guest house. After it was destroyed by fire in the 1950’s my father rebuilt Alf’s into a café of 3,000 square ft. which then catered for road transport until 1994 when the village was by-passed by the new A31 bypass. My grandfather and his wife divorced in 1942. 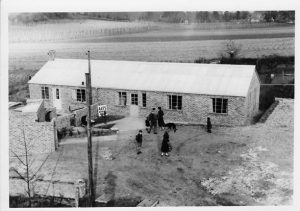 My grandfather became Resident Engineer at the Canadian War Veteran’s hospital and Huron Camp which was situated opposite Bramshot Common on the A3 near Liphook, Hampshire. There is now a memorial park where the hospital stood, in memory of the Canadian soldiers who died in WW2. Having lived with him, I observed at first hand my grandfather’s skill in plumbing and metal work. He made baking tins, trays, pots and pans for the new Café. During the war it was interesting to me, as a nine year old, watching many Army vehicles, Bren-Gun carriers, Churchill and Sherman tanks rumbling and roaring through the village. There were Spitfires and Hurricane aircraft on large low loaders. There were even lorries with steam engines hauling large military loads, albeit very slowly. Our house was only about four feet from the road because it was originally built as a Toll house over 200 years ago. It was built with lime mortar and no footings, the bricks having being laid directly on to the sandy soil. Despite all those tanks and heavy vehicles there are no cracks in the old part of the building. Our house did not have electricity or mains toilet. We had coal fires and coal gas which was manufactured at the gas works in Farnham. The by-product of heating coal to create gas was coke. This was used extensively in this area to make roads and can still be seen built into walls. Runfold probably got its name from being a stopping place for sheep being herded to market before the advent of vehicle transport. The village was a farming community and the main crop was hops for the brewing industry and nearly every acre in sight was covered by a network of poles and wires to support the vines. It was amusing to see the farm hands walking on stilts six feet high to tie the strings which would carry the vines. These strings had to be replaced every year. At hop-picking time the gypsies came and camped in the area to pick the hops by hand. Their whole families were involved. They all became good regular customers throughout the life of Alf’s café. My mother was called Alice and she married my father on 2nd March 1931. I was born on 16th Feb 1934. She ran the first Alf’s Café when my father was doing demolition work on bombed buildings in London. She was a powerfully built woman. I saw her knock out a lorry driver when he cheekily invited her to punch him. She had had a hard life by that time; at the age of twelve she was sold into service as a maid to a large household and developed tuberculosis due to the bad conditions. In March 1957 when I was demobbed from The Royal Engineers I began working for my father operating the business and started a bakery at the Café. I baked all our own bread, rolls, cakes pastries doughnuts, pies, pasties and even cooked our own ham. 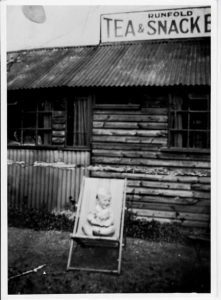 In 198o I married a Chinese lady, Peggy Chen and she worked with me in the café until the village was by-passed by the A31. Up to that time we lso operated a successful antique and collectables shop. In February 1993 the Runfold Bypass was started and it was complete by August 1994. Prior to the completion date we had been doing over five hundred transactions per day; but after the new road opened we only averaged five meals. This was partly due to the transport companies fixing GPS trackers into the vehicles and instructing drivers to keep to their given routes. It did stop a lot of private trading by some of the small truck drivers. In 1996 the café finally stopped trading. Alfred Edwin Ambrose Green was born 14/07/1909 and died 27/12/1983 And Alice Irene Green was born in 1904 and died in 1990. Further stories related to Alf’s café and its customers are told in the book called Dunce Or Dyslexic by Simpleton (B. Green) which is on Amazon Kindle eBooks. It’s hard to imagine some of the goings on from times gone by with so much freedom to what is seen today. How far have we come in so short a time when we consider the conditions you describe so well? Your vast and worldly wise experience I have come to know from your books to date make your reading a must for you do not know upon what escapade, adventure, or plight you might stumble. A delight to have found you published here!